Activision has an all-new Transformers game on its slate for next year, one that looks like it will be taking gameplay cues from Gears of War. According to the newest issue of Game Informer, Transformers: The War for Cybertron is a third-person shooter that chronicles the Autobot's battle waged against the evil forces of the Decepticons. And vice versa, as early reports from subscribers and serious Transformers fans indicate we'll play as both robotic factions. The game is said to be in development at High Moon Studios, developers of Darkwatch and The Bourne Conspiracy, and due for a 2010 release. Transformers: The War for Cybertron apparently falls outside various Transformers continuities with a look that's less blocky than the Generation One style of 'bot, but not as visually offensive as the Michael Bay version of the classic Takara toy. 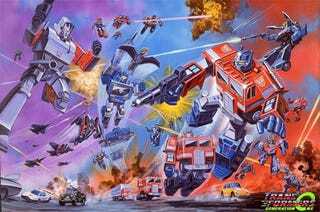 Allspark.com forum members peg the visual style as resembling the Transformers: The War Within comic book series. Seen in the mag are Optimus Prime, Megatron—tank-style, not handgun-style—Soundwave, Ironhide and more. Xbox 360, PlayStation 3, and PC versions of the new Transformers game are said to be in the works. And if we know Activision, it won't stop there.